View the threads art_n_garden has started. Leave feedback for art_n_garden or read feedback left by other members. View the member feedback art_n_garden has written of others. "I've been gardening "seriously" for about 7 years now...my garden is my church, where I find myself and a greater being. Going outside at any moment is much easier than waking up on Sunday mornings (to me). My husband and I bought our first home three years ago and I am finally seeing some fruits from all my labor. 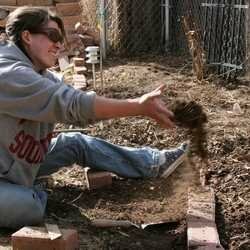 Gardening in Zone 5/6 is a challenge, but I have fallen in love with plants I'd never heard of before I moved to Colorado. " "Taken by my mom (bookworm28) in my garden! "